My 5 year old had her heart set on a Halloween costume that she found in a catalog chock full of high end costumes that she had discovered from my mom’s house. The costume was a leopard with all the fanciness you can handle with a full twirly black skirt, faux fur gloves to the elbow, and spotted ears. Of course, it cost a small fortune. I dare wager a kidney transplant might be cheaper. I kicked my honed parenting skills into high gear and attempted a persuasion technique where I could distract her by finding a much cheaper version of pretty much the same costume. I’m dealing with a five year old, this shouldn’t be hard. No other leopard costume that we searched out would suffice. It had to be this one and only this one. I might have to take out a loan, but by gosh this was the costume. I dragged my feet for a couple of days. By the time I logged back in to place the order, lo and behold, it was sold out. What to do, what to do? Surely another costume will work since there’s just no way around this problem, so I tried my persuasion technique again, searching the inter web high and low for suitable substitutions to no avail. I was only greeted with crocodile tears and a stubborn streak a mile wide. Nothing else would do. No other costume on the planet was as good as that one. She only ever wanted to be this leopard. Only this one with the full twirly black skirt, faux fur gloves to the elbow, and spotted ears. So I did everything in my power. I contacted the company: Will you be getting item #34756389 in stock in a size 5 before Halloween? What to do? What to do? She would just have to face the music. The costume was not to be had. Disappointments are part of life, she had better learn to deal with them now, right? When she was told we would have to find another costume, more tears ensued. At this point, I was a bit exasperated. 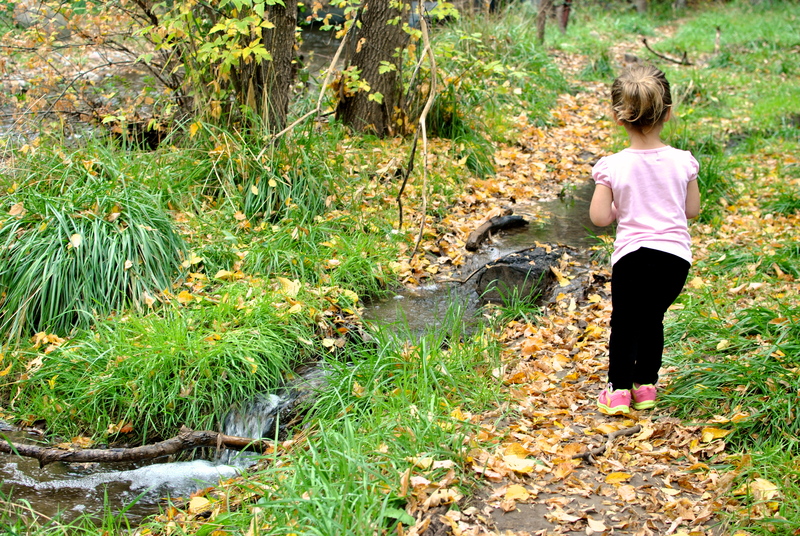 I advanced my parenting skills from persuasion to guilt. It sounded something like, Do you have any idea how ungrateful you’re being? Do you know there are children out there who would love to get a new costume? Or to even get to go trick or treating? To dress up as anything even remotely interesting? And here you are, with a play room full of princess dresses, and various and a sundry other accessories and yet all you want is this one and only danged old leopard costume. Do you see how spoiled your acting? Tears and more tears. No other costume would do, it was decided. It was this costume. It had to be this costume. The one that was sold out and wasn’t coming back. What to do, what to do? I’m no rookie. At this point, I upped my ante of parenting skills and decided to throw in a little reverse psychology. It sounded something like, Well then fine, you can just not go trick or treating. You can just stay home and hand out candy. This technique blew up right in my face when through her big old tears, she said that was just fine with her. I should have quit right there. I should have waved the white flag. But she comes by her stubborn streak honestly. I couldn’t in good conscience allow her to stay home and not trick or treat when she is only five years old! They grow up so fast. Trick or treating and costumes are such a blink in time. The mommy guilt reared it’s ugly head full force. I took a deep breath, let some days pass, and suggested we should look on Pinterest for a costume idea. Good ol’ Pinterest. She agreed to this idea. We pulled up Halloween costumes and she found one she wanted. The Poop Emoji. Yes, poop. My dear little, beautiful, darling daughter wanted to dress up as a pile of crap. I said how about a smiley? How about a winkie face? How about a unicorn? No. None of those would do. It was this costume. It had to be this costume. It had to be a poop emoji. It took some doing, but we got it done. A shirt, a little brown tulle, and wa-lah! She was the gosh darned cutest turd I’ve ever seen. She won second place in her school’s costume contest for most original Costume and she was a hit among those who were savvy enough to know what she was. We trunk or treated and trick or treated until she said she’d had enough. We turned on the light and she handed out candy for a few straggling kids. 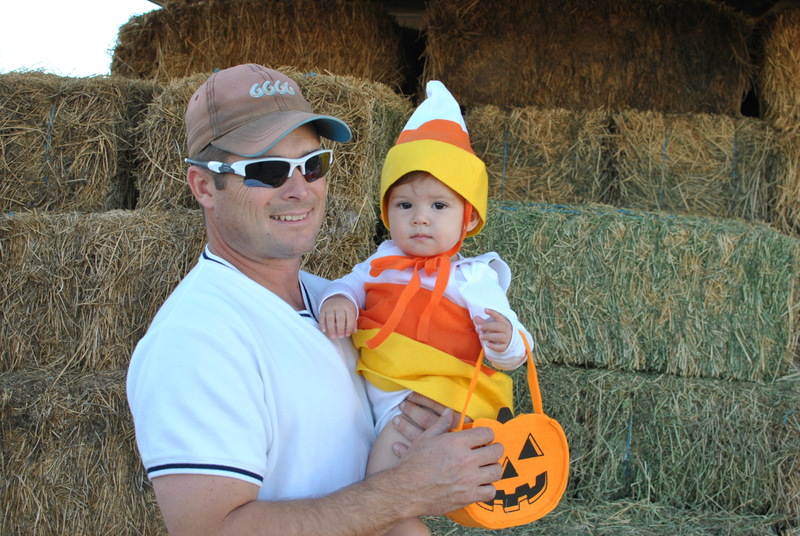 I held her in my lap when the day was done, candy wrappers strewn, costume in a wad on the floor, chocolate on her face. You’ve had a good day. I told her. You had a great costume too. And wasn’t it better than that danged old Leopard costume? That’s when I cried. Tears and more tears. She’s already decided on next year’s costume. And it’s not a dangled old Leopard either. So make sure you stop by my house, because after this experience, this little turd will be home handing out candy. The colors here are breathtaking. The air is crisp and cool. The smell of fireplaces fill the air. October is my favorite time of year. I don’t have too much to say, I just wanted to share some pictures. 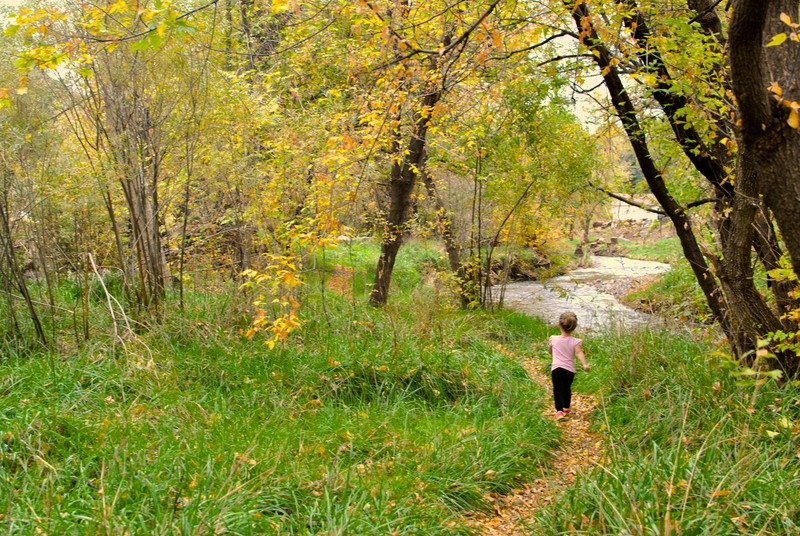 We like to walk down by the river and crunch leaves. Our cat, who thinks she’s a dog, walks beside us. We throw rocks in the creek. EK has a cheesy smile these days. It’s the month of costumes. We were asked to dress up as a super hero to help out our library for an event. Ek was batgirl and her little friend was Wonder Woman. 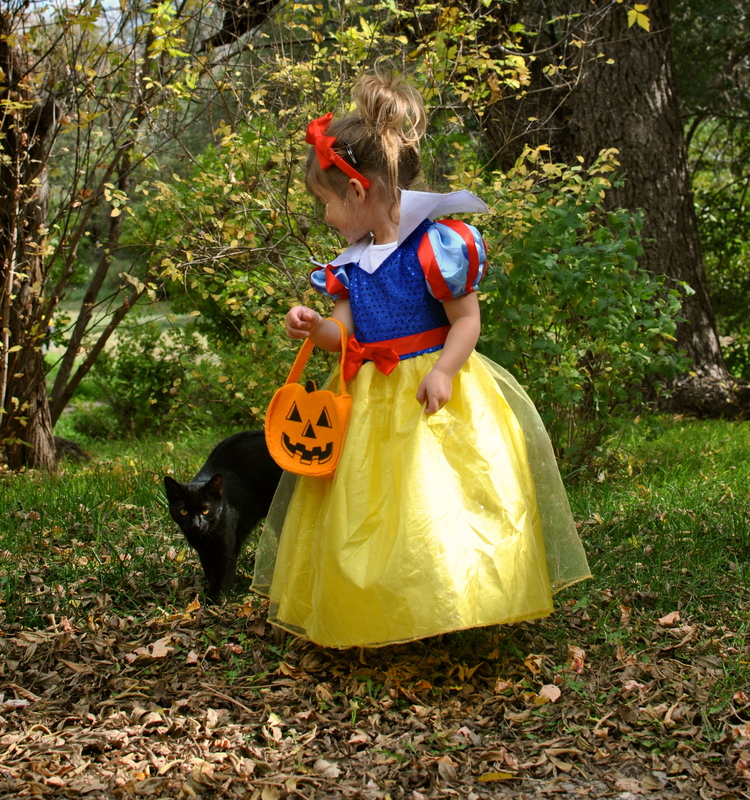 For Halloween, she was Snow White. She had so much fun getting candy. In three months, she’ll be three years old. Her hair is nearly to her waist. Lately I find myself remembering. Today I looked at pictures and couldn’t help wondering where the time has gone. I know these days too are fleeting. Like the changing of the leaves. I live in a very cool place. Not braggin’ or anything, just stating facts. I have come to really love it here, and why not? I am in the midst of the Creator’s glory. Truly. Mountains, streams, wildflowers, and trees. One of the perks of living in a very cool place is that sometimes I look out my front door and see cool stuff. And sometimes, I see not very cool stuff, like bear trash. 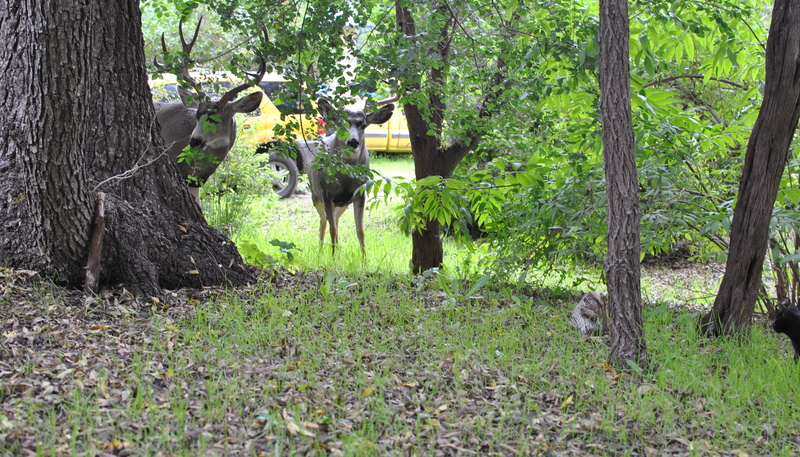 Among the cool stuff are two big bucks that came to say hi the other day. If I knew anything at all, I’d be able to tell you what kind of point system these dudes were on. But whatever. Sidenote: I may or may not have a thing for yellow vehicles. So do the deer. Not gonna lie, I was a little bit leery of being this close, with my little EK by my side and all. Those are really some big antlers and I’m not real sure if they would charge, but of course the vision of being gored by deer entered my mind. A reel of every episode of “When Animals Attack” shortly followed. Our cat was very curious too. You can see her photo bomb in the lower right corner of the second picture. 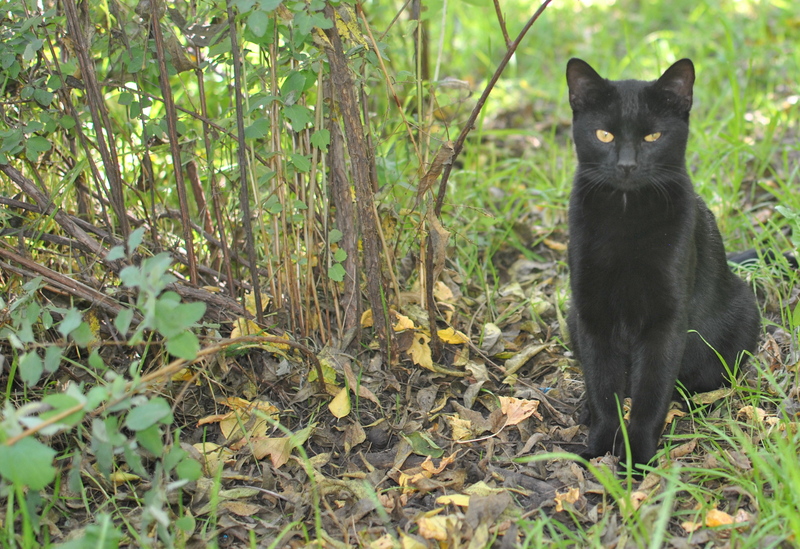 Speaking of very cool things: I have a black cat and it’s October!!! October means Halloween! Does anyone else think that’s awesome besides me? No? Well I think it’s very cool. 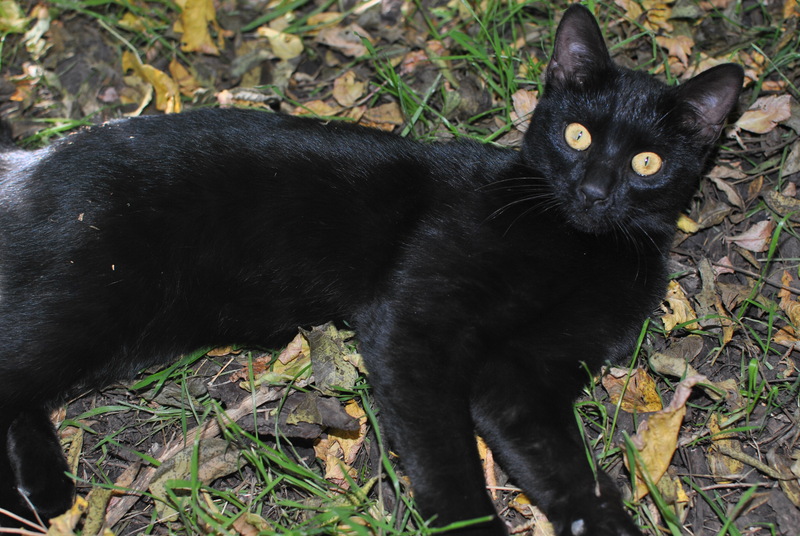 The leaves here are in an array of colors and taking a picture of a black cat in fall leaves is currently on my bucket list. Y’all remember this cat? Isn’t she a beauty? I have come to adore her. It is definitely a ‘she’. And her name is Rocky Muffin. But sometimes EK says, “I changed her into a boy” so then we call ‘him’ Bagheera. As I don’t have a ton of cat experiences, I really have nothing to compare this cat to…..except a dog, and let me tell you, she is just like a dog to the point of jumping in the car to go for rides and following us on our walks. Yesterday, I tried to get some cool pics of ol’ Baggy, but didn’t really succeed. It just so happens, unlike a dog, she doesn’t know how to sit or stay. It’s still a lot green here, mostly because we have some cool season grass, which unlike normal grass, stays green until Spring, then it dies. So there’s more summer than autumn in my pictures. But whatever. I’m not giving up yet, so be on the lookout for more pics of this cat. Maybe shoved in a jack o’ lantern? Maybe being gored by a buck? The possibilities are endless. My motherly decision making center of the brain was shorting out. What to do? What to do? 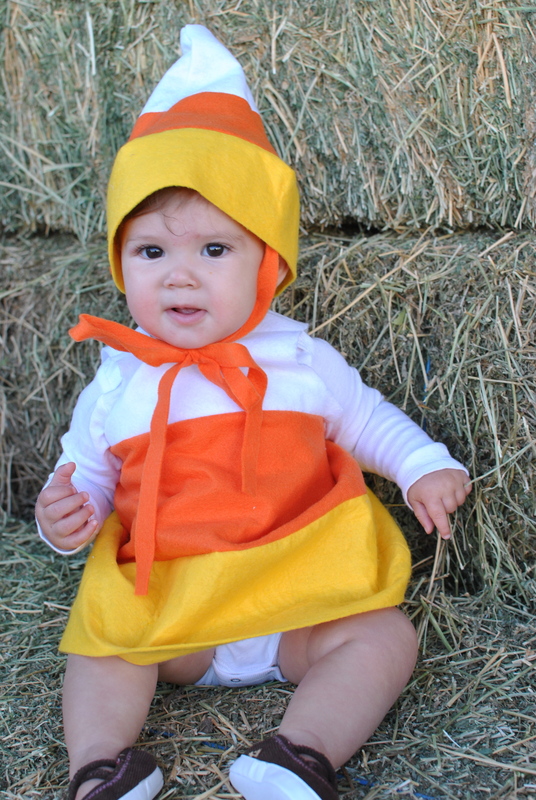 The practical, frugal Rocket Surgeon side of me said celebrating EK’s first Halloween is ridiculous. 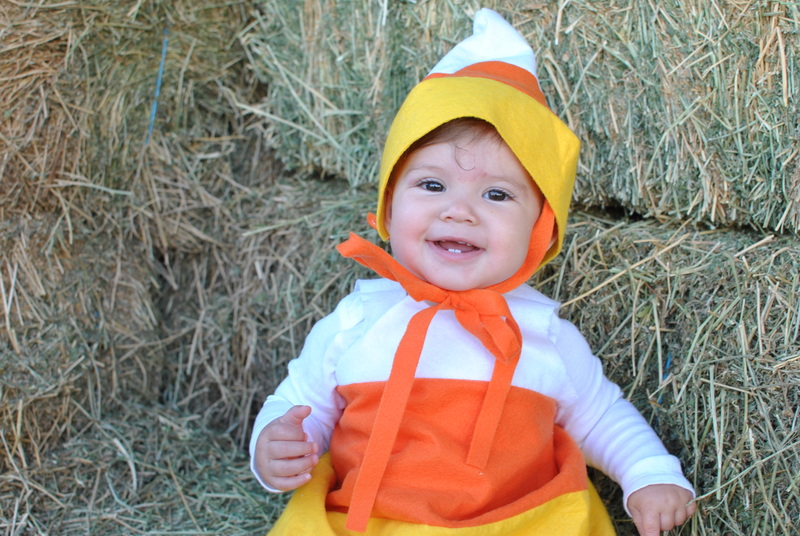 She’s nine months old for Heaven’s sake, she has no earthly idea what in the world we would be doing, she can’t even walk, much less ring a doorbell and say Trick or Treat. She can’t even eat candy! It’s silly to spend money on a costume she is going to wear once in her lifetime. We’ll have plenty of years to do the whole Halloween thing. The sentimental, sappy Rocket Surgeon side of me said celebrating EK’s first Halloween is essential. She’s just nine months old, she’ll be so cute in a costume, she’ll need a picture for the baby book, she might think I was some horrible mother later on down the road (which will happen when she’s sixteen anyway) if we don’t. Why would I want to miss out on this opportunity to share her with others? So on October 31st, at around 11:00 a.m. I made up my mind. We would do a small version of the Halloween thing. Put on a costume, go to some family and close friends, visit out church festival, then come home and go to bed. So while she took a nap, I was able to put her costume together. And then of course, since I’m a beginner sewer, I was able to rip some of it out and re-put it together. But it came together fairly simply with not too many frustrations on my part. She hates hats. Absolutely won’t leave them on. Even with a “stampede string”, we fought that thing. She kept pulling it off, until I showed her herself in the mirror, and just like that she decided it was too cute to take off. We made our rounds and enjoyed the night. I must admit, she looked sweet enough to eat!